Give those who fight MS daily a dose of inspiration to stay strong and not let their disease get the better of them. 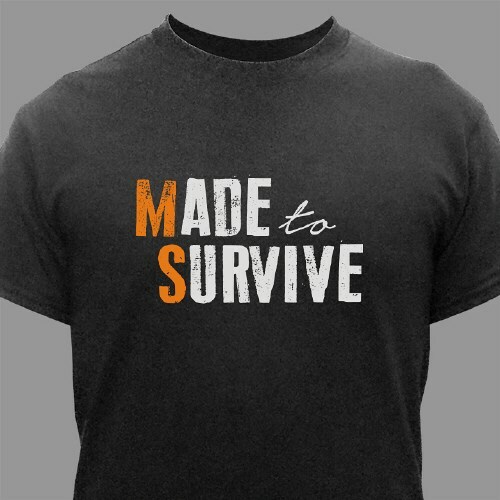 Our "Made to Survive" t-shirt is the perfect shirt to give them. This would be a great piece to wear at your next MS walk or event, too. Let this MS awareness tee be your constant reminder to never give up hope and always fight for a cure. The Made to Survive design is printed on our premium, pre-shrunk, 100% cotton t-shirt. Our MS shirts are machine washable and available in adult sizes S-3XL. They create an inspirational way to spread MS awareness. Love the MS T-Shirt I ordered & the Print on front is perfect! Even after washing! Great Price too! The shirt fit perfect and the material is thick like I like it. My husband loves his shirt. He hasnt worn it yet but if he dont I am.